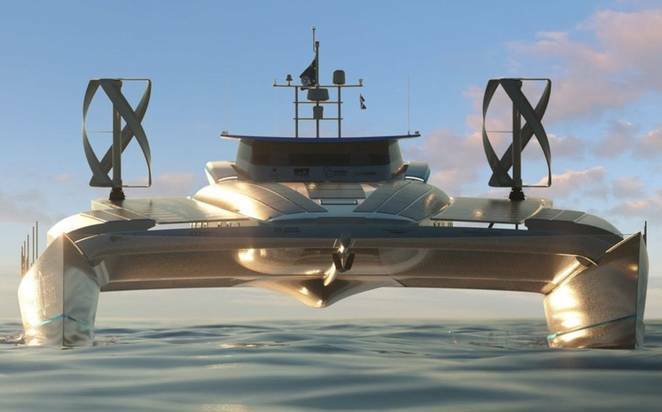 The completely energy independent catamaran that will start its would tour in April 2017 from Paris and will travel five years to make 101 stops around the world has been making waves on social media, see @H2Euro. To achieve energy independence, it will use solar panels in combination with PEM electrolizer to make hydrogen as a way to store energy. H2 will be stored in type III reservoirs and then PEM CEA fuel cells will be used to transform it back to energy when needed. About fifteen companies will take part in the project. The goal is to test technologies and to promote the use of clean fuels. Currently, the 30 meters long and 13 m wide boat is under construction at the naval center Jacques Cartier in the French city Saint Malo.